We are embracing the wrinkled bed over here at our house. We are linen people. I wear linen all summer...tops, shorts, pants and dresses, I like the lightweight comfort of it. Husband wears linen dress shirts and slacks in warm weather too. 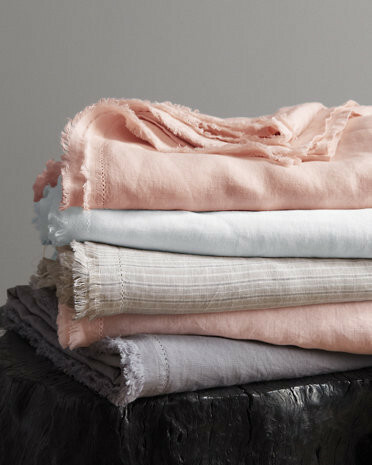 I have ogled the linen bedding by Eileen Fisher on Garnet Hill and thought MUST HAVE! But the price of her king linen duvet is $298 and I did not want to pay that of course! Then last fall, we happened upon Linblomma linen bedding at Ikea. The price for a king duvet and set of king cases....$89! Hmm, quality must be compromised but for that price, we'll give it a try. Husband, in his usual Ikea buying style (also his Costco buying style), insisted we get three because the price was so low. We negotiated to two, one for our bed and one for a guest bed. I saved them for warm weather. Warm weather is here so after washing and drying with unscented dryer sheets yesterday and NOT ironing them, we slept on them last night and LOVED them! So soft, fabric did not require breaking in as sheets sometimes do. Used the cases for the top pillows and were comfy all night. 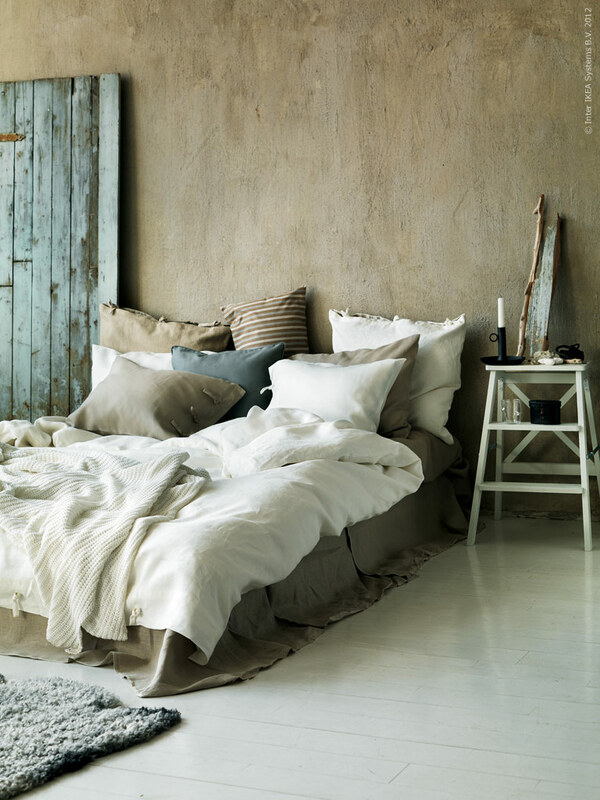 Here is Ikea's photo of the bedding on Livet Hemma. Of course, husband now says we need to get another set, just in case, on our next visit! Do you change up your bedding in warm weather like we do? What a great review, I love input on Ikea products, and they look great too, I would have expected more wrinkles! I too have lusted over Garnet Hill and then thought twice and thrice about the price. I never thought of Ikea! I'll be checking their site today - thanks for the tip! Thanks so much for your review of this duvet cover! I had just found it and wondered if the price was too good to be true :) Do you have linen sheets as well as the duvet? I'm looking for a bottom sheet to go along with it. I'm debating whether to buy this. Now that a year has passed, are you still happy with them? Oh, and I've had mine for over a year, love it still. I found a Linblomma duvet cover on eBay cheaper than I could buy it at Ikea, took the plunge and bought it along with a wool-filled duvet insert. It's amazing! So soft and not scratchy, much nicer than any linen shirt I've ever owned. I wish Ikea sold sheets, after experiencing this linen duvet I really dislike my cotton fitted sheet. I've been looking for a linen flat sheet (hospital corners) or fitted sheet for a reasonable price. I may just get another Linblomma duvet cover and use that as my "bottom sheet". I have this, at first I was unsure, but now i love it. I have the white one and would buy it again in a heartbeat if anything ever happened to it. I've never owned the higher priced linen linens but for this price point I am super happy with it and am thankful they came out with it. H&M also has a linen duvet cover but i much prefer this one. I do like my H&M linen bottom sheet though, got 2 of them. Anyway, so glad H&M came out with this, looks amazing. Thanks for your review. I am looking at ordering/buying this. Would you say this color is a bright white or more of a creamy white? Glad you like it, because I just bought a set in the thrift shop for a great 12 dollar price. I have other linen duvet cover, which I got in the garage sale, and I will turn that one into the fitted sheet, since it is very heavy. I hope this one is lighter weight. Looks good, but when I tried IKEA linen it was too rough for me. Linen from Pottery barn was way better, softer. A colleague told me to check out MagicLinen on Etsy https://www.etsy.com/shop/MagicLinen?ref=hdr_shop_menu . I got some great quality bedding from them: duvet and pillow cases and 2 more pillow cases. Pretty much the same as Pottery barn, maybe even better and lower price. Much softer than Ikea! Looks good, I really admire your post about luxurious duvet cover and curtains. We always agree with you. Hi Cindy, Would you mind sharing where you got that bolster pillow from? Or the name of the fabric. I would love to know! Thanks!! Superb photos! Linen staff is trending, I found very nice staff from small family based producers like Magiclinen.com I like small producers more than Ikea or H&M.